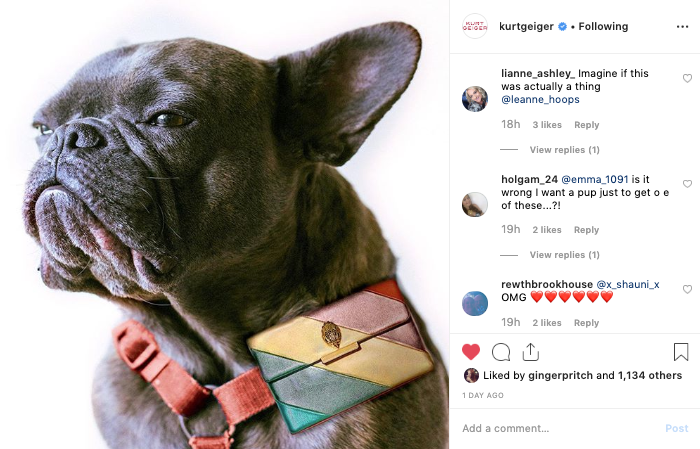 While working at Kurt Geiger, I was asked to come up with a concept to use across their social channels as an April Fools. As you’ll know if you read my About page, I love to pat dogs wherever I go so the answer was simple; shoes and bags for dogs…as well as glamorous collars and luxe leads. I retouched images with some of the products materials onto pictures of cute pups and flipped in the brand colours for a more pawthentic experience. Got a project like this? I’d love to help you! Just tap the button below and let’s chat!